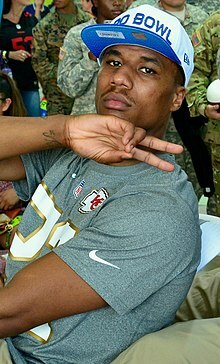 Marcus Peters (born January 9, 1993) is an American football cornerback for the Los Angeles Rams of the National Football League (NFL). He was drafted by the Kansas City Chiefs in the first round of the 2015 NFL Draft. He played college football at Washington. Peters attended and graduated from McClymonds High School in Oakland, California, where he played football and ran track. He played as a cornerback for coach Curtis McCauley. As a senior, he notched seven interceptions and scored six touchdowns on kick or punt returns. He also played wide receiver and kicker. He was named the MVP of the Oakland Athletic League, as he led the Warriors to a 12-0 record, the school's first perfect season. In track & field, Peters competed as a sprinter. and as a senior he won the 100 meters (10.87 s) and 200 meters (22.91 s) events at the Oakland Athletic League Championships. Peters was a three-star recruit by Rivals.com and the 30th best cornerback in his class. He committed to play college football at the University of Washington in January 2011. Peters was redshirted as a freshman in 2011. As a redshirt freshman in 2012, Peters started eight of 13 games, recording 44 tackles, three interceptions and a touchdown. As a sophomore in 2013, he started 12 of 13 games and had five interceptions, 55 tackles and one sack. As a junior in 2014, Peters was suspended one game for a "sideline tantrum". He was later dismissed from the team in November for disciplinary issues. On December 16, 2014, Peters announced his decision to forgo his remaining eligibility and enter the 2015 NFL Draft. Peters attended the NFL Scouting Combine and completed all of the combine and positional drills. On April 2, 2015, Peters participated at Washington’s Pro Day, but opted to stand on his combine numbers and only performed positional drills. Peters attended pre-draft visits with multiple teams, including the Kansas City Chiefs, New York Jets, New Orleans Saints, San Francisco 49ers, Oakland Raiders, Pittsburgh Steelers, Baltimore Ravens, and Houston Texans. He also attended a private workout with the Atlanta Falcons. At the conclusion of the pre-draft process, Peters was projected to be a first or second round pick by NFL draft experts and scouts. He was ranked as the second best cornerback in the draft by Sports Illustrated, was ranked the third best cornerback by NFL analysts Mike Mayock and Charles Davis, and was ranked the fourth best cornerback prospect by DraftScout.com. The Kansas City Chiefs selected Peters in the first round (18th overall) of the 2015 NFL Draft. Peters was the third cornerback drafted in 2015 and also became the highest defensive back drafted from Washington since Dana Hall (18th overall) in 1992. On May 15, 2015, the Kansas City Chiefs signed Peters to a fully guaranteed four-year, $9.58 million contract that includes a signing bonus of $5.23 million. Throughout training camp, Peters competed against Phillip Gaines to be a starting cornerback. Head coach Andy Reid named Peters the No. 1 cornerback to begin the regular season after Sean Smith received a three-game suspension. He made his professional regular season debut and first career start in the Kansas City Chiefs’ season-opener at the Houston Texans and recorded seven combined tackles, three pass deflections, and made his first career interception during their 27–20 victory. Peters intercepted a pass by Texans’ quarterback Brian Hoyer, that was intended for wide receiver DeAndre Hopkins, during the Texans’ first offensive snap of the game. The following week, Peters recorded five solo tackles, made a season-high four pass deflections, and returned an interception for his first career touchdown during the Chiefs’ 31–24 loss against the Denver Broncos in Week 2. Peters intercepted a pass attempt by Broncos’ quarterback Peyton Manning, that was intended for wide receiver Demaryius Thomas, and returned it for a 55-yard touchdown in the second quarter. In Week 5, he collected a season-high seven solo tackles and deflected one pass as the Chiefs lost 18–17 to the Chicago Bears. On December 20, 2015, Peters made three combined tackles, tied his season-high of four pass deflections, made two interceptions, and returned one for a touchdown in a 34–14 win at the Baltimore Ravens in Week 15. Peters intercepted a pass thrown by Ravens’ quarterback Jimmy Clausen, that was intended for tight end Daniel Brown, and returned it for a 90-yard touchdown in the fourth quarter. On December 22, 2015, it was announced that Peters was one of three rookies voted to play in the 2016 Pro Bowl. He started in all 16 games during his rookie season in 2015 and recorded 60 combined tackles (53 solo), 26 pass deflections, eight interceptions, two touchdowns, and one forced fumble. He set career-highs in tackles, pass deflections, and interceptions. His eight interceptions tied Cincinnati Bengals’ free safety Reggie Nelson for the most interceptions in 2015. Peters received multiple honors as a rookie in 2015, including second Team All-Pro, Associated Press Defensive Rookie of the Year, and was a finalist for the Pepsi Rookie of the Year award. Peters was the fourth Chiefs’ player to win defensive rookie of the year joining Dale Carter, Bill Maas, and Pro Football Hall of Famer Derrick Thomas. He was ranked 65th by his fellow players on the NFL Top 100 Players of 2016. The Kansas City Chiefs finished second in the AFC West with an 11–5 record and earned a wildcard berth. On January 9, 2016, Peters started in his first career playoff game and made four combined tackles, a pass deflection, and intercepted a pass by Brian Hoyer as the Chiefs defeated the Houston Texans 30–0 during the AFC Wildcard Game. The following week, Peters recorded five combined tackles and deflected two passes during a 27–20 loss at the New England Patriots in the AFC Divisional Round. Peters entered training camp slated as the No. 1 cornerback after Sean Smith departed in free agency. Head coach Andy Reid named Peters and Phillip Gaines the starting cornerback tandem in 2016. On September 18, 2016, Peters recorded a season-high seven combined tackles, made four pass deflections, and intercepted two pass attempts by Brock Osweiler during a 19–12 loss at the Houston Texans in Week 2. The following week, Peters made one tackle, two pass deflections, and two interceptions off Jets’ quarterback Ryan Fitzpatrick as the Chiefs defeated the New York Jets 24–3 in Week 3. Peters was inactive for the Chiefs’ Week 11 loss to the Tampa Bay Buccaneers after suffering a hip pointer the previous week. He finished the 2016 NFL season with 45 combined tackles (35 solo), 20 passes defensed, six interceptions, and one forced fumble in 15 games and 15 starts. Peters was named to his second career and consecutive Pro Bowl and was named a first-team All-Pro. He was also ranked 32nd on the NFL Top 100 Players of 2017. Peters’ six interceptions tied for second in the league in 2016. Peters retained his role as the No. 1 starting cornerback in 2017 and started the season opposite Terrance Mitchell. On October 27, 2016, Peters was fined $9,115 for a helmet hit on Oakland Raiders quarterback Derek Carr in the 31–30 loss. In Week 12, Peters collected a season-high six solo tackles during a 16–10 loss to the Buffalo Bills. During Week 13 against the New York Jets, Peters threw a penalty flag into the crowd after his teammate Steven Nelson was flagged for defensive holding while the Jets were attempting a two-point conversion. Peters was flagged for unsportsmanlike conduct for throwing the side judge’s flag into the crowd; the holding penalty was accepted while the unsportsmanlike penalty was declined. Peters was seemingly ejected, but instead retreated to the locker room and later returned, but did not play for the remainder of the Jets’ 38–31 victory. On December 6, 2017, the Kansas City Chiefs announced their decision to suspend Peters for the next game. Three days after the suspension was announced, it was revealed that Peters’ suspension also was the result of an argument he got into with an unnamed coach for the Chiefs. On December 8, 2017, Peters received a $24,309 fine from the NFL for an unsportsmanlike conduct penalty stemming from the incident involving a penalty flag. On December 16, 2017, Peters recorded three solo tackles, deflected three passes, and also intercepted two passes by Chargers’ quarterback Philip Rivers during a 30–13 win against the Los Angeles Chargers in Week 15. His performance earned him AFC Defensive Player of the Week. Peters was inactive was a healthy scratch for the Chiefs’ Week 17 victory at the Denver Broncos. He finished the season with 46 combined tackles (42 solo), nine passes defensed, five interceptions, and four forced fumbles in 14 games and 14 starts. Peters led the Kansas City Chiefs in interceptions for the third consecutive season. Peters received an overall grade of 85.7 from Pro Football Focus, which ranked as the 17th best grade among all qualified cornerbacks in 2017. He was ranked 79th by his peers on the NFL Top 100 Players of 2018. On March 14, 2018, the Kansas City Chiefs traded Peters and a sixth round pick (209th overall) in the 2018 NFL Draft to the Los Angeles Rams for a fourth round pick (124th overall) in 2018 and second round pick in the 2019 NFL Draft. On April 24, the Rams exercised the fifth-year option on Peters' contract. Head coach Sean McVay named Peters and Aqib Talib the starting cornerbacks to begin the regular season. He started in the Los Angeles Rams’ season-opener at the Oakland Raiders on Monday Night Football and made three combined tackles, deflected a pass, and returned an interception thrown by Derek Carr for a 50-yard touchdown during the fourth quarter of their 33–13 victory. On September 14, 2018, he was fined $13,000 for an endzone celebration. In Week 4, he collected a season-high six solo tackles in the Rams’ 38–31 victory against the Minnesota Vikings. He started in all 16 games in 2018 and recorded 43 combined tackles (33 solo), eight pass deflections, three interceptions, and one touchdown. Peters received an overall grade of 60.1 from Pro Football Focus, which ranked 95th among all qualified cornerbacks in 2018. The Los Angeles Rams finished first in the NFC West with a 13–3 record and earned a first round bye. They went on to defeat the Dallas Cowboys 30–22 in the NFC Divisional Round and defeated the New Orleans Saints 26–23 in overtime in the NFC Championship Game. The victory advanced the Los Angeles Rams to Super Bowl LIII against the New England Patriots. In the Super Bowl, Peters recorded 7 tackles and 1 pass defended but the Rams lost 13–3. ^ "McClymonds HS Juggernaut Inspired By Coach's NFL Son". CBS - San Francisco. December 5, 2017. Retrieved October 3, 2018. ^ "McClymonds alum Marcus Peters probably has an NFL future". ^ "Washington Huskies". Washington Huskies. ^ "Oakland Section Finals - Complete Results (Raw)". ^ "McClymonds High's Marcus Peters commits to Washington". January 24, 2011. ^ "UW star cornerback Marcus Peters suspended one game for sideline tantrum". ^ "Washington Huskies' Marcus Peters dismissed from team". ESPN.com. November 6, 2014. ^ "Report: Washington CB Marcus Peters to enter 2015 NFL Draft". NFL.com. December 16, 2014. Retrieved January 31, 2019. ^ "49ers pre-draft visits: Team to meet with Marcus Peters for official visit". ninersnation.com. March 31, 2015. Retrieved January 31, 2019. ^ "Report: Marcus Peters visits hometown Raiders". 247sports.com. April 16, 2015. Retrieved January 31, 2019. ^ "Ravens have met with Marcus Peters, Dorial Green-Beckham, Randy Gregory, P.J. Williams". Baltimore Sun. April 8, 2015. Retrieved January 31, 2019. ^ "Jets will host Dante Fowler Jr., Kevin White, Marcus Peters on pre-draft visits". NJ.com. April 12, 2015. Retrieved January 31, 2019. ^ "2015 NFL Draft: Falcons work out CB Marcus Peters". thefalcoholic.com. Retrieved January 31, 2019. ^ "2015 NFL Draft: Mike Mayock's top 100 prospects". NFL.com. Retrieved January 31, 2019. ^ "SI's Top 64 Prospects in the 2015 NFL Draft". si.com. April 24, 2015. Retrieved January 31, 2019. ^ "2015 NFL Draft prospect rankings by position". NFL.com. April 1, 2015. Retrieved January 31, 2019. ^ Thorman, Joel (April 30, 2015). "NFL Draft results: Marcus Peters to Kansas City Chiefs with 18th overall pick". ArrowheadPride.com. Retrieved May 27, 2017. ^ "Pro Football Reference: Washington Drafted Players/Alumni". pro-football-reference.com. Retrieved January 24, 2019. ^ "Spotrac.com: Marcus Peters' contract". Spotrac.com. Retrieved January 24, 2019. ^ "KC Chiefs 2015 NFL Draft Grade Card: Marcus Peters". kckingdom.com. Retrieved January 24, 2018. ^ "Take a look at the Chiefs' depth chart for the Texans in Week 1". foxsports.com. September 8, 2015. Retrieved January 24, 2019. ^ "Kansas City Chiefs at Houston Texans - September 13th, 2015". pro-football-reference.com. Retrieved January 24, 2019. ^ "Denver Broncos at Kansas City Chiefs - September 17th, 2015". pro-football-reference.com. Retrieved January 24, 2019. ^ "Kansas City Chiefs at Baltimore Ravens - December 20th, 2015". pro-football-reference.com. Retrieved January 24, 2019. ^ "2016 Pro Bowl Roster". NFL.com. December 22, 2015. Retrieved January 24, 2019. ^ a b "NFL Player stats: Marcus Peters (career)". NFL.com. Retrieved January 24, 2019. ^ "NFL Player Stats: Interceptions (2015)". NFL.com. Retrieved January 24, 2019. ^ "'Top 100 Players of 2016': No. 65 Marcus Peters". NFL.com. ^ "Wild Card - Kansas City Chiefs at Houston Texans - January 9th, 2016". pro-football-reference.com. Retrieved January 24, 2019. ^ "Kansas City Chiefs at Houston Texans - September 18th, 2016". pro-football-reference.com. Retrieved January 26, 2019. ^ "New York Jets at Kansas City Chiefs - September 25th, 2016". pro-football-reference.com. Retrieved January 26, 2019. ^ "Justin Houston plays, but Marcus Peters misses first game for Chiefs". KansasCity.com. November 20, 2016. Retrieved January 26, 2019. ^ "Marcus Peters Stats". NFL.com. Retrieved October 3, 2018. ^ "'Top 100 Players of 2017': No. 32 Marcus Peters". NFL.com. Retrieved October 3, 2018. ^ "Chiefs place CB Steven Nelson on IR, expect him back this season". chiefswire.usatoday.com. September 3, 2017. Retrieved January 26, 2019. ^ "Chiefs first depth chart is here and not much has changed". arrowheadpride.com. September 3, 2018. Retrieved January 26, 2019. ^ "Marcus Peters fined $9,115 for hit on Derek Carr". Pro Football Talk. Retrieved October 27, 2017. ^ Hanzus, Dan. "Marcus Peters throws penalty flag into the stands". NFL. Retrieved December 3, 2017. ^ Bergman, Jeremy. "Chiefs suspend Marcus Peters for game vs. Raiders". NFL. Retrieved December 6, 2017. ^ Shook, Nick. "Marcus Peters' suspension also due to rift with coach". NFL. Retrieved December 9, 2017. ^ "Jamaal Charles among Broncos' inactives for season finale against Chiefs". DenverPost.com. December 31, 2017. Retrieved January 26, 2019. ^ Larrabee, Kirk (January 11, 2018). "Marcus Peters Is Racking Up Interceptions At An Impressive Rate". 247sports.com. Retrieved May 23, 2018. ^ DaSilva, Cameron (February 25, 2018). "Watch All 21 Interceptions Of Marcus Peters' Career (So Far)". Retrieved May 24, 2018. ^ "Marcus Peters Trade Rumors: Chiefs CB 'May Not Be Long for Kansas City'". bleacherreport.com. Retrieved January 27, 2019. ^ Simmons, Myles (March 14, 2018). "Rams Acquire CB Marcus Peters". therams.com. Retrieved May 29, 2018. ^ Sessler, Marc (April 24, 2018). "Rams exercise options on Todd Gurley, Marcus Peters". NFL.com. ^ "Rams Week 1 depth chart: Kelly is No. 4 RB, Littleton starting next to Barron". theramswire.usatoday.com. September 4, 2018. Retrieved January 27, 2019. ^ "Watch: Marcus Peters returns INT for TD, does Marshawn Lynch celebration". USA Today. September 11, 2018. Retrieved October 3, 2018. ^ "Marcus Peters fined over $13K for TD celebration". NFL. Retrieved September 14, 2018. ^ "Pro Football Focus: Marcus Peters". profootballfocus.com. Retrieved January 27, 2019. ^ "NFL Player stats: Marcus Peters (2018)". NFL.com. Retrieved January 27, 2019.